Infuse your garden with the calming, peaceful Heavenly Blues Iris Mixture Super Sak®. This mix of Iris germanica includes a magnificent medley of exquisite blue flowers whose shades range from the crisp, icy blues of a clear winter day to the striking cobalt of twilight. Fragrant varieties intermingle with multi-coloured and painted cultivars. This eye-catching assortment blooms in mid to late spring in a breathtaking display. Plant your Dutch-sourced Iris germanica rhizomes in the fall, covering them to 1 inch below the soil level and spacing them 12 to 24 inches apart in clay, loamy or sandy soil. They prefer well-drained soil. 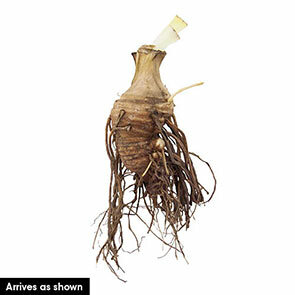 This tall bearded iris collection will thrive in full sun to partial shade in zones 4 to 9. 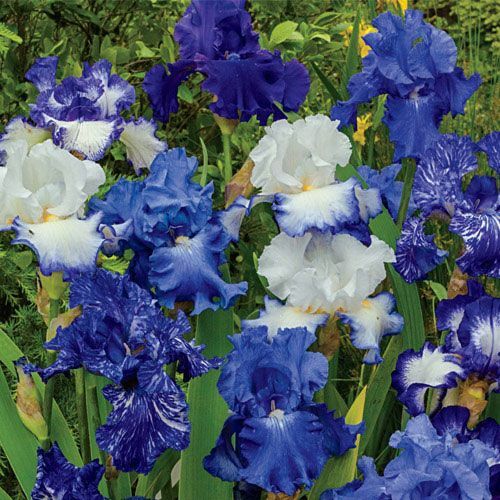 The spectacular perennial irises in this selection grow 35 to 40 inches tall, and each plant produces an abundance of blooms that make a garden come alive. The Heavenly Blues iris mixture Super Sak is an excellent choice for naturalizing, and will return in greater numbers every year. These uniquely-shaded flowers are also at home in formal gardens, pairing well with lavender and alstroemeria. Their distinctive blue blooms make a vivid impression in beds and borders. Many ancient cultures believed that the colour blue helps promote relaxation. Add a soothing touch to your landscaping with this marvelous mix of heavenly blues. From light sky-blue falls and white standards that resemble puffy clouds to the deep, dark indigo that is twilight, you'll find these blooms as mesmerizing as the ever-changing sky. Some are fragrant, and all feature a high bud count.